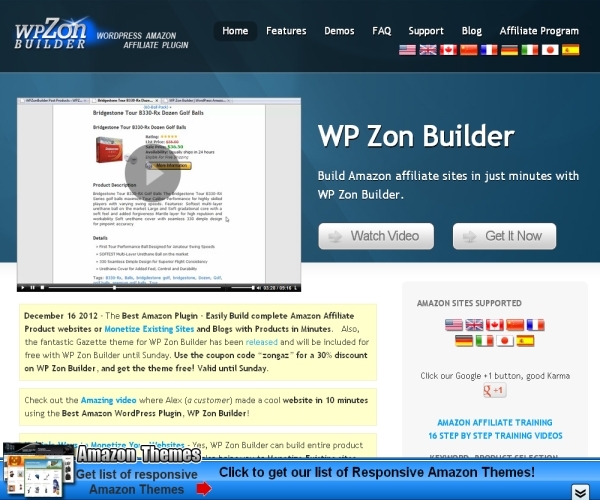 WP Zon Builder is a premium plug-in that allows you to connect to the Amazon affiliate program and use conversions to build your affiliate income. You can create a fully-loaded affiliate site within not time by and can also add your own reviews and products. The plug-in is compatible with all Amazon sites across different languages (United States, Canada, United Kingdom, France, Germany, and Japan). The plug-in also integrates with related affiliate plug-ins for eBay, Over Stock etc. You can set the products posts to be immediately displayed or can defer them to appear at a future date. The plug-in comes with extensive search options that allow you to search through the database of Amazon’s products by using category, keyword and other filtering options. You can also dynamically run a stored query which fetches the current products fulfilling that criteria from Amazon and can also set an expiry period for products. Users can also add reviews to the products which would be displayed along with the stored reviews from Amazon. The plug-in also allows you to display related items, accessories and similar products as sidebar widgets. You can also include video reviews and insert a Fancybox gallery for your images. The plug-in comes with built-in SEO options that instantly drive users to your site. It has built-in link cloaking, All in One SEO pack integration, support for microformats and auto bolding of keywords in product description. You can also view all your click logs and can also export them to a spreadsheet. This allows you to focus on products which have a better affiliate conversion potential. The WP Zon builder comes with lifetime free updates, included tutorials and documentation. It’s priced at $99.00 and can be used on multiple sites.